Detroit Skyline, by Brent Rostad @ Flickr. Between the rampant legalized looting, an emergency manager thrust upon them, water turn-offs, threatened pensions, and darkened streets, the people of Detroit have been to hell and back. Now they can add grotesque racial insensivity from a newspaper editor to their list. We learn through Electablog that Keith Crain, editor-in-chief of Crain’s Detroit Business , displayed his remarkable lack of humanity with an op-ed meant to convey what Motor City requries to move forward: “Maybe we need a permanent overseer” (the headline has since been changed). In Crain’s view, the leaders are the city are not smart enough to run it. “This is not to cast aspersions on our current politicians. But we don’t know how long they will be in office and who will replace them. Certain members of the Detroit City Council have already proved to require oversight for their personal conduct. We don’t have any idea about financial conduct. Is the white publisher of Detroit’s major business publication unaware that slave plantation imagery might be offensive to the residents of a city where nearly 83% of the people are African American, one of the largest black populations of any American metropolis? Apparently not. The truth is that a big chunk of blame for Detroit’s financial trouble resides with the mostly white, besuited denizens of Wall Street, who drove a financial meltdown and who screwed the city over with financial schemes that drained its coffers. Is that where the “overseer” is meant to come from? This isn’t the first time nasty racial undercurrents have swept into public discussion of Detroit’s problems. Last year, Rush Limbaugh blamed the city’s woes on African Americans who had driven whites out of the city. It was all those civil rights protests in the ’60s, the big-mouthed radio host claimed, that started the Detroit’s downfall. Detroit has become the “Other” of American cities — cast as deserving of its troubles. It is true, as Maya Wiley points out, that disinvestment intimately linked to racism has long plagued Detroit, but to blame this on black people fighting for fair and decent treatment is the height of hypocrisy. 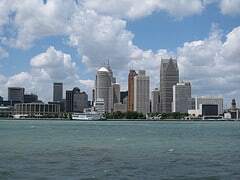 Frankly, Detroit’s entire bankruptcy carries undercurrents of racism, as the Economic Policy Institute has pointed out. Lynn Parramore is an AlterNet senior editor. She is cofounder of Recessionwire, founding editor of New Deal 2.0, and author of “Reading the Sphinx: Ancient Egypt in Nineteenth-Century Literary Culture.” She received her Ph.D. in English and cultural theory from NYU. She is the director of AlterNet’s New Economic Dialogue Project. Follow her on Twitter @LynnParramore.